Attended a Christening in Lanark and was at a lunch table afterwards with a chap who had an expensive looking camera round his neck. My wife asked him if he was keen on photography and he said not really, but as a model train enthusiast he always carried his camera with him. A bit of a coincidence; but it turns out that his friend has built a French HO scale layout - that really stunned me. Anyway, gave the chap my email address for his friend to contact me. The Christening was held during a Church of Scotland Sunday service. The first time I'd attended a Church of Scotland service for many, many years. 1) Superb stain glass windows - absolute works of art. 2) Very accomplished organist who played preludes and an introit the equal of anything one would hear on Radio 3's Choral evensong. 3) A choir of maybe 20 strong (mainly women and average age in late 50s). 4) Female minister - no problem with that; she had plenty of authority. 5) Vastly superior singing to that found in a typical West of Scotland RC church. 6) Lots of chit-chat between minister and congregation; clapping and laughing. 7) There were some German visitors to the church so one of the Lessons was read in German. 8) Very clear diction in the readers. Despite the outstanding musicianship and articulation on display, the service was much more informal than an RC Mass. It was like a cross between an AGM and a coffee morning. I don't say it lacked reverence or spirituality - it was just different. My one reservation probably only applies to me: but I don't like a welcoming atmosphere as defined by congregants waiting to greet you at the door and trying to get to know you. I don't like being serially greeted as I enter a church. It feels like being pressured into being friends. I don't go to church to find friends. I know full well after the first few exchanges of smiles they simply won't like me. You can slip into and out of RC Masses and never speak to a soul yet still play a full part in the service. Last night I was re-reading Malcolm Muggeridge's memoir "The Green Stick". He quotes from Johnson's 'Life of Savage'. "The reigning Error of his Life was, that he mistook the Love for the Practice of Virtue, and was indeed not so much a Good Man as a Friend of Goodness." The theme of the sermon at today's Christening was posed in the question: "Am I an admirer of Christ or a Disciple of Christ?" 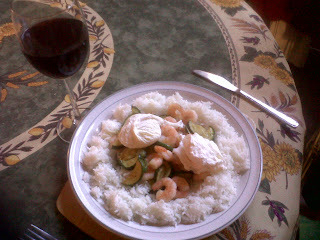 Large prawns, courgettes, rice and two poached eggs washed down by a cheap Southern French wine.